Custom Name Pink and Blue Marble Phone case - Unique personalised Name/word marble effect phone case. Stylish, slim and durable hard plastic phone case. All cases can be customised with a name - just send us a message with any questions. depending on order size and shipping address. 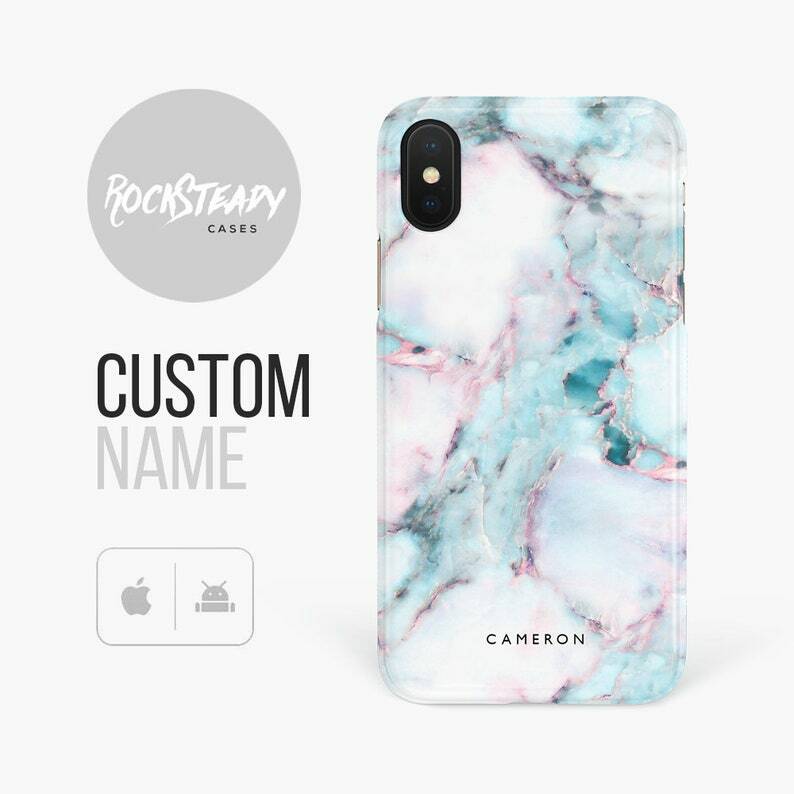 Rock Steady Cases sell unique phone cases, accessories, customised gifts and designer passport covers. Our 3D full wrap cases are created using the latest technology to create a full image wrap around the whole hard plastic/polycarbonate case. Colours can vary slightly monitor to monitor and please be aware that when you receive your case the colour depths might vary slightly to what you see on screen. My daughter loved her personalised phone case. Thank you. Unfortunately original order didn't arrive but the issue was soon sorted. Great customer service from Tom. Very nice case. Communication with seller is amazing. The case is beautiful and looks exactly like the picture. The engraving hasn't fade away at all. I was scared about that but I have it on since November and it didn't move an inch. My phone fell a few time and the full cover protected it perfectly. The seller is also very kind, he was very helpful and quick to answer. Can any of the phone cases be customised? Yes, any of our products can be customised. Just send us a message and let us know if you want a normal case personalised. We can supply wholesale worldwide for all cases. Please get in touch for more information.